Pen and brown ink, and wash, over black chalk on laid paper; divided into quadrants in black chalk. Sir Joshua Reynolds (Lugt 2364); his sale, London, Phillips, 5 March 1798? ; Reverend Henry Wellesley; his sale, London, Sotheby's, 25 June-10 July, 1866, lot 2364? ; Sir William Richard Drake (no mark, see Lugt 723, 736, 2473); his sale, London, Christie's, 24-25 May 1892, lot 403; Charles Fairfax Murray (1849-1919), London and Florence; from whom purchased through Galerie Alexandre Imbert, Rome, in 1909 by Pierpont Morgan (1837-1913), New York (no mark; see Lugt 1509); his son, J. P. Morgan, Jr. (1867-1943), New York. 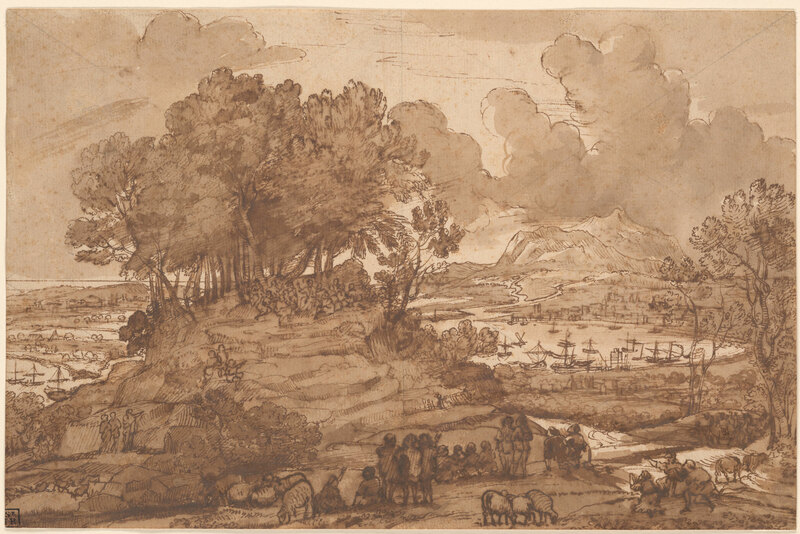 For ambitious paintings such as The Sermon on the Mount, painted in 1656 for the Bishop of Montpellier (now in the Frick Collection, New York), Claude produced several compositional studies; this is the third of four drawings of the scene. Claude sets the narrative in a vast landscape that strives for topographical accuracy, although he never visited the Holy Land. The distant Mount Lebanon and the Sea of Galilee are at right, and the Dead Sea and the river Jordan are at left. At center is Mount Tabor, where Christ, as described in the Gospel of Matthew, is shown preaching to the multitude. Study for a picture formerly in the collection of the Duke of Westminster, now in the Frick Collection, New York.